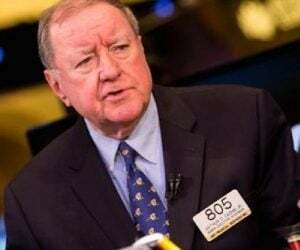 As the world edges closer to the next crisis, today the man who has become legendary for his predictions on QE and historic moves in currencies shared with King World News one of the most shocking stories you will ever read. 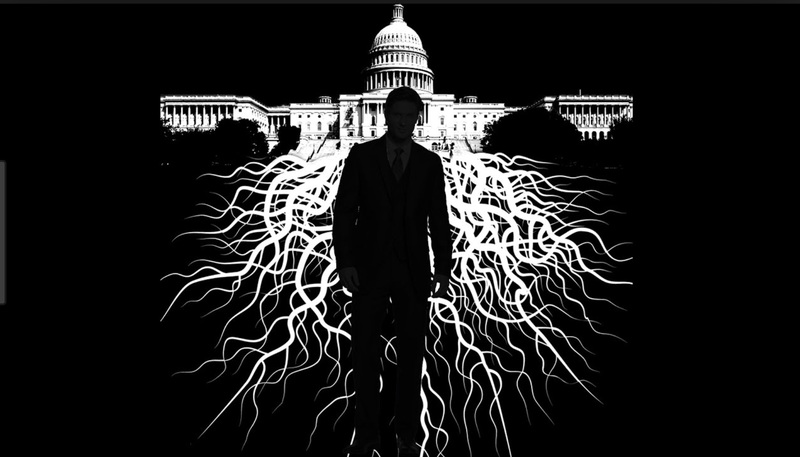 Greyerz also warned the Western Gold Maginot Line will fall in 2019, triggering panic. by CLICKING HERE OR ON THE IMAGE BELOW. Egon von Greyerz continues: “The history of China and gold is fascinating, and even more so when Japan’s looting of Chinese gold is added to the story. Japan was interested in the Chinese gold since the Sino-Japanese war in 1894. Japan spent time and resources on the Manchurian gold exploration from that time to the end of WWII. Japan is said to have looted a considerable amount of gold from mines in northeastern China. Not only that, but in 1937 as the Civil War in China was raging and Mao and the communists pushed Chiang Kai Shek out, the Japanese invaders stole 6,600 tonnes of gold from the Chinese capital Nanking. This is a lot of gold! The value today would be $280 billion. 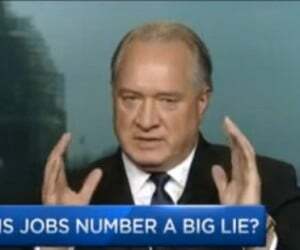 The US is allegedly the biggest gold holder in the world with 8,000 tonnes. But as I wrote in a recent KWN article, most of that gold is probably in China and the rest spread throughout Asia as the US has disposed of or leased most of its gold. The US will never get back the gold, and whatever they have leased is also gone forever. The Fed and most central banks lease gold into the market in order to earn a return as well as to unnaturally suppress the gold price. This gold used to stay in London or New York with the LBMA bullion banks. But today, Silk Road countries, including Russia, buy all the gold they can vacuum out of the West. Thus, the LBMA banks give the central banks an IOU and then sell the physical gold to the East. For the central banks, that gold is gone forever. 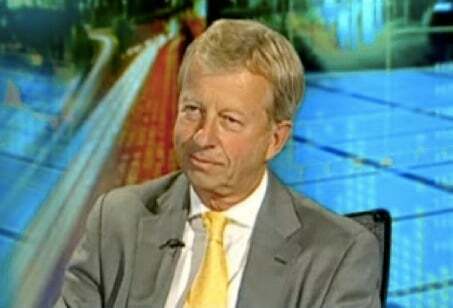 The LBMA will never find sufficient gold to hand the gold back to them, so that paper gold IOU is totally worthless. This means that the LBMA banks will fail as they can’t make good on their physical gold commitments. 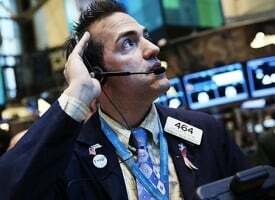 Meanwhile, the central banks’ vaults will remain empty, leading to a collapse of the country’s currency and a surge in the gold price. Circling back to the looted gold, the 6,600 tonnes that Japan stole from China became part of the Yamashita gold. This was gold and treasures that Japan looted all over Asia from China, Korea, Indonesia, and Malaysia. The gold was hidden mainly in the Philippines and Japan. Yamashita was the Japanese general in charge of constructing massive and very intricate tunnels to hide the stolen gold and the other treasures. 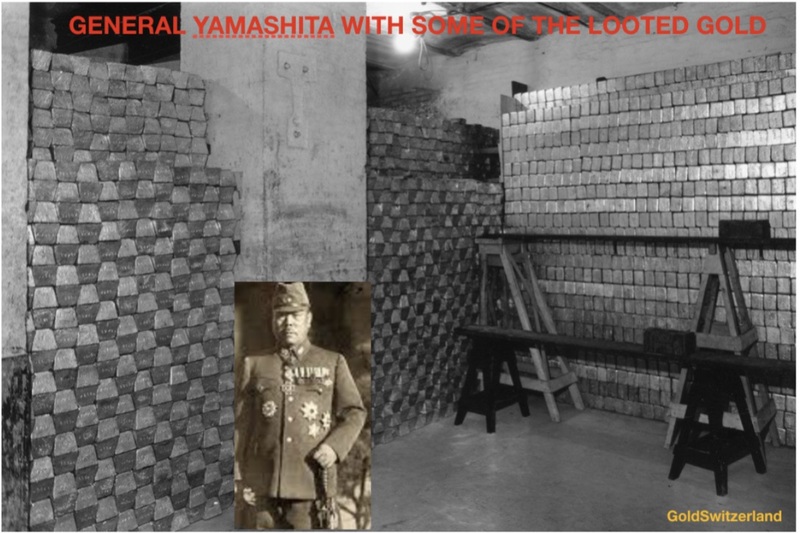 The looting and hiding of the gold involved massive atrocities committed by the Japanese army. Major parts of this gold have been found by the US and reportedly used for black operations all around the world. 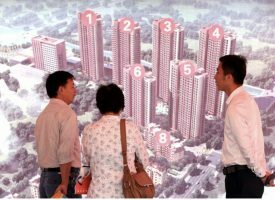 The Chinese people have learned the hard way the importance of gold. China was the first country to introduce fiat money during the Tang Dynasty circa 740 BC. The value of the Chinese fiat money remained stable until the Yuan Dynasty in the 13th and 14th centuries. This was the first period of Chinese hyperinflation as they printed vast amounts of money to fund their wars. Later, in the 1930s and 40s, Chinese money lost its value completely as the Chiang Kai Shek rule was coming to an end. He was was the president of Mainland China from 1928 to 1949. Chiang started in grand style. Loans made up 49% of the government revenue in 1929. The finances deteriorated further after the Japanese invasion in 1932. In the final years of Chiang’s rule, the Chinese economy was collapsing and money printing was rampant. One US dollar was worth 3.4 yuan in 1937. But by 1949, one US dollar was worth 23 million yuan. 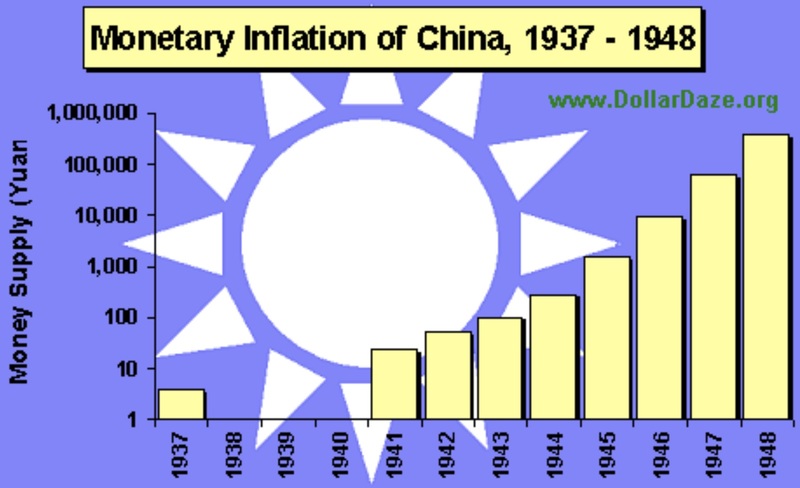 China’s inflation rate reached a maximum monthly rate of 2178% in May 1949 with an equivalent daily inflation rate of 11%, according to the Cato Journal. The highest denomination at the time was 6 billion yuan. Why: China’s nationalist government took over the nation’s banks and switched from silver standard to fiat currency. It then used the currency to monetize its debt (sound familiar) and continued printing money during the war with Japan and the civil war fought against Mao’s communist forces (see chart below). The Chinese understanding of the importance of gold started during this hyperinflationary period as economic conditions deteriorated severely. 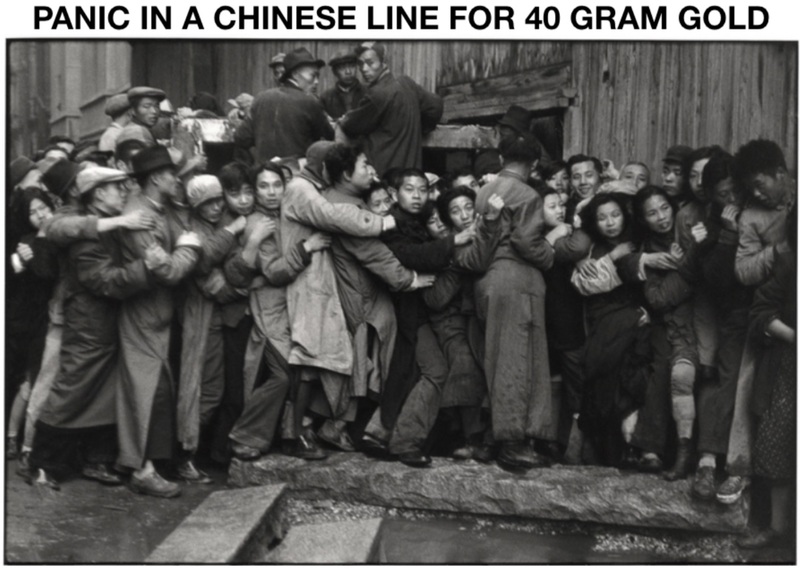 The photographer Henri Cartier-Bresson captured, in the famous picture below, a proper Chinese gold run. In December 1948, as the currency became worthless, the Nationalist government decided to issue 40 grams of gold per person. As the photo shows, there was total panic to get hold of the life saving gold and many people were literally crushed to death during the mayhem. This would be an anathema to anyone in the West. Virtually no individual saves any of his money in gold. Instead, the average American or European spends all of his income and then borrows a lot more for consumption, studies, cars, and housing. The Chinese Gold Line is the first line which I mentioned at the beginning of the article. Virtually nobody in the West understands the significance of this line. The line signifies the desperation of people after a period of severe mismanagement of a country’s finances. The whole world today is in a similar situation. After over 100 years of destruction of paper money through the buildup of massive credit and money printing, we will soon get to the point when people around the world will be desperate to get hold of real money (gold). But at that point it will be too late. Interestingly, there are virtually no gold shops to be found in the West. London has two specialized shops where gold bars and coins can be purchased. In Zurich there is one in the centre and one outside. The same goes for most cities. A few decades ago, virtually every Swiss bank sold gold and had gold in the windows. That is all gone. And UBS used to have specialist gold counters in many places but they are also gone. Admittedly there are a number of online gold sellers. 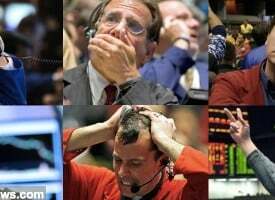 Within the next few years, we will see similar panic lines in front of the few gold shops that still exist today. The panic will be worse because these shops will have no stock to sell, not even the 40 grams ($1,800 today) that the Chinese got in 1938. When the masses wake up to the fact that gold is the only way to survive the coming crisis, there will be no gold available at any price. 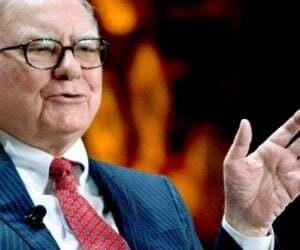 The paper gold dealers like Comex or the LBMA banks will have defaulted on their commitments since they have no gold to deliver against massive amount of paper claims, which are many 100s of times larger than the available gold stock. 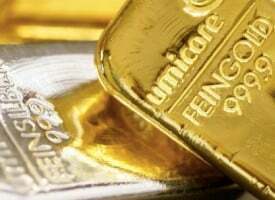 So for anyone who wants to own some gold, now is the time to buy it, not when the papers start writing about gold or the television broadcasts the panic in the gold market. Then it is too late and you will not get any gold at any price. Again, today is the time to get your gold because tomorrow will be too late. And if I am slightly off on my timing, all you have done is to buy life saving insurance a few days too early. The second line is what I call the Gold Maginot Line. Maginot was the French minister of war before WWII started. He built a very intricate line of fortifications to protect France from attack by Germany. The line was impervious to most forms of attacks and had underground garrisons, railways etc. Still, the Germans attacked north of the line through Holland and Belgium and eventually managed to break through in the Ardennes forest. The modern use of the Maginot line expression is a strategy which inspires a false sense of security. The Maginot Line, or Gold Maginot Line, I refer to is the line of resistance in the gold price since August of 2013. As the chart below shows, the gold price has been held below the $1,350 level for the last 5 1/2 years. 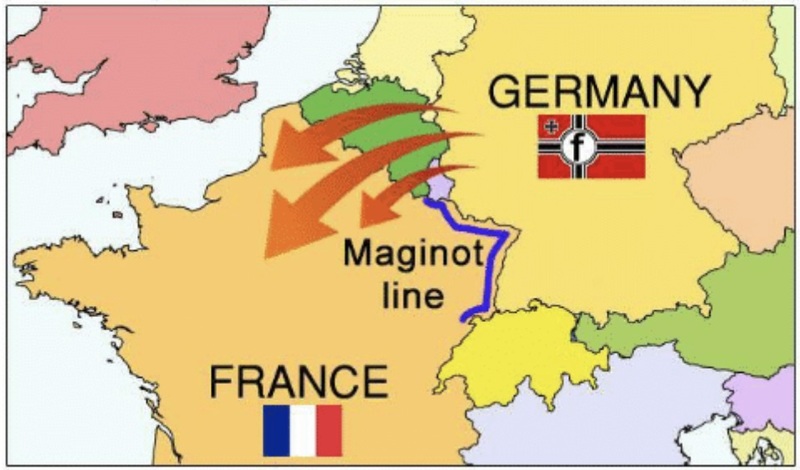 The Gold Maginot Line was attacked in 2016 and 2018, but was successfully defended both times by an increasingly desperate West. Regardless, whether the line just represents 5 years of consolidation or whether it has been actively defended by the BIS and bullion banks doesn’t really matter. No one must believe that the line will hold. 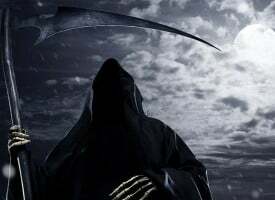 It is extremely likely to be decisively penetrated in 2019, and most likely within the next 90 days. 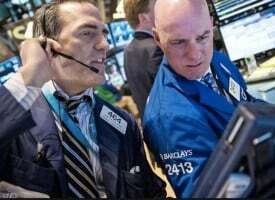 And once it is broken, the lengthy gold correction will finally be viewed as being over and the price of gold will be well on its way to new all-time highs and beyond. 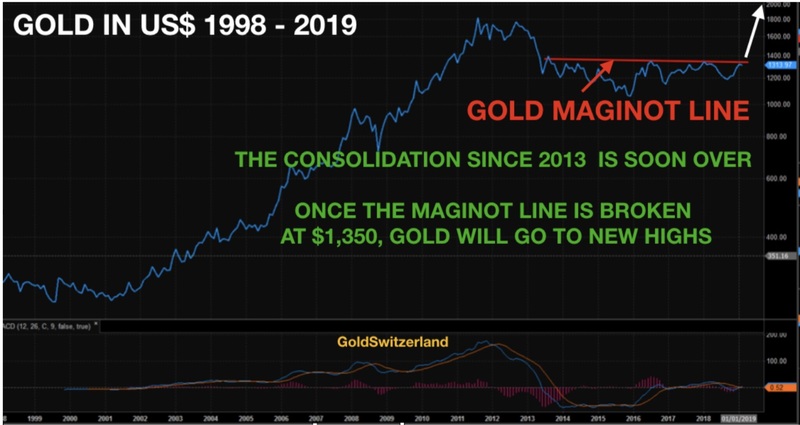 Once the Gold Maginot line is broken, that creates the conditions for the Chinese Line, which means a panic in the West to get hold of gold that will be met with permanent shortages. So the current belief in the West that gold has lost its luster, which has led to complacency since the peak in 2011, is extremely dangerous. But as I said previously, don’t wait for either of these lines to be penetrated, triggering panic. Because when that happens, it will soon become extremely difficult to get hold of physical gold at any price. And remember, you are not buying gold for investment. Instead, you are buying gold for wealth preservation or insurance purposes, which means for financial and physical survival. Without that you could end up like the Venezuelans or any other historic victims of hyperinflation…For those who would like to read more of Egon von Greyerz’s fantastic articles CLICK HERE. KWN has now released the fascinating KWN audio interview with Rick Rule CLICK HERE OR ON THE IMAGE BELOW. ***Also just released: Rick Rule – The Time To Buy Gold CLICK HERE TO READ.